Is it Safe to Eat Food Past its Best-Before or Use-by Date? Recently there has been quite a bit in the news about whether it is safe to eat food that has gone past its best-before or use-by date, and even more worrying, food being retrieved from skips and bins to eat. So what are the risks and more importantly, what can you do to save money with food without putting yourself or your family at risk? These dates are used for quality purposes and you will find them on long-life foods, including frozen foods and tinned goods. It is not a safety issue to eat foods after the expiry of the best before date, but the food may not taste so good, and really old dried goods may have become infested with larder pests such as weevils of course. These are dates used by the manufacturer to ensure that food is consumed within a safe time-frame. Manufacturers go to great expense to get this right. They take into account the type of food, the acidity, amount of sugar, amount of water in the product and the temperature it will be stored at. They get microbiological tests done to check the food is safe right up to the end of the use-by date, but not afterwards. Once you open a packet of a food such as ham, the use-by date changes to whatever it says on the packet about the length of time you should keep the food after opening – typically only a few days in the fridge; so it may actually be unsafe to eat even before the expiry of its original use-by-date. So, can you tell whether the food is safe to eat or not in any other way other than the use by date? Don’t be fooled – bacteria such as Listeria are very happy to grow in the fridge, undetectably to the nose or eye. If you are over 60, then you are more vulnerable to suffer from Listeria, and it can kill about 30% of those who get it. If you are pregnant then you stand a 20% chance of losing your baby to miscarriage if you contract Listeria. Thankfully it is rare, but cases in elderly people have been increasing in recent years, and causing concern. It may be that some sectors of the community are taking unnecessary risks with food because of poverty and a need to eat whatever food they have bought, regardless of how old it is and whether there may be a risk attached. Gastro-intestinal disease is avoidable, yet a quarter of the population will suffer from it in any year – proof that something is going wrong. Whilst many of us blame the last meal (usually a meal eaten outside the home) very often it is our home hygiene that is the culprit. So what can be done to improve our chances of resisting food poisoning and yet not breaking the bank? Top Tips to Save Waste, Save Money and Be Safe! Buy only what you need, and look at the use-by dates when you shop. 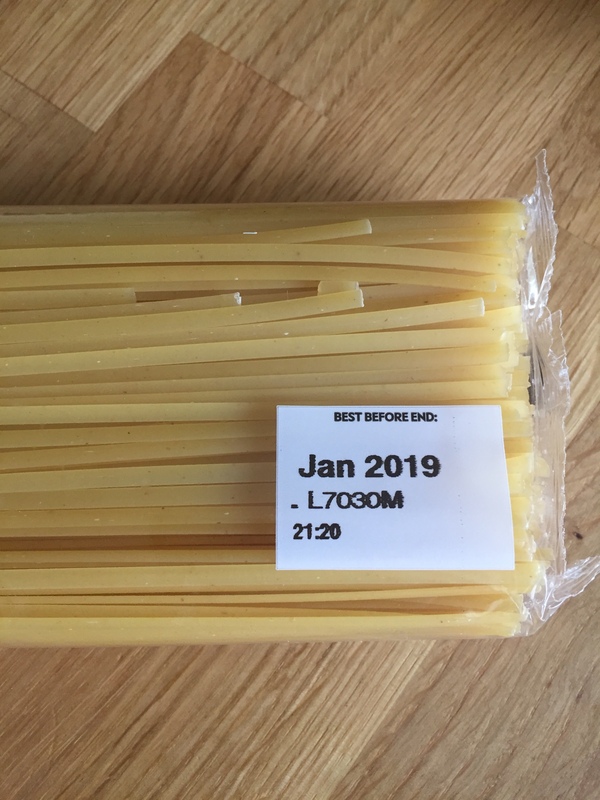 Only buy food within the dates when you are likely to use the food – takes a bit longer, but saves throwing food away because you haven’t got time to eat it! Get hold of a few plastic boxes in various sizes, a roll of labels and a pen. Label whatever you put in the freezer with date of freezing and what the product is. Some foods with high fat content are best eaten within a month as the fat can go rancid – it is still safe but tastes horrible. If you are tempted to buy an offer and end up with too much of the same food, freeze what you can on the day of purchase. Even ham can be frozen – you can chop it up and put it in a bag to use as extra pizza toppings. Some people make sandwiches for packed lunches in advance so they can defrost them on the day they need them in their lunch box. You can freeze left over cream and use it in curries. You can freeze bread and use it straight in the toaster for toast – then the bread stays fresh and you only have out what you need. You can make sandwiches from frozen bread – by the time it is lunch-time the bread will have defrosted and the cold temperature will help keep your lunch safe! Puree fruit if it is getting over-ripe and freeze it for smoothies. Bananas can be frozen peeled and frozen whole in bags – they are brilliant blended into a milk shake or smoothie. Tomatoes going soft – make them into a sauce or soup with some onion and or celery, or roast them and then puree. This can be frozen and is ready for a home made pasta sauce or pizza topping. Cheese can be grated and frozen if it is getting hard – then use it for cooking. Separated eggs can be frozen if you have made a meringue and have too many yolks. Left overs can be frozen – but cool them rapidly and then get in the freezer as soon as they are at room temperature. Defrost foods in the fridge to stop bacteria growing on them as they warm up. Heat to 75°C to make sure any bacteria are blitzed. As for eating food out of a bin or skip – well if it is a potato or carrot and you peel and cook it, there won’t be much harm done. But if it is a packet of ham that is past its use-by date and has been basking in the sun all day, you wouldn’t catch me being tempted by it even I were hungry. I wouldn’t want to take the risk of getting food poisoning – that empty stomach feeling will be even worse if you get diarrhoea and sickness. And it could kill you.